Left Hand Miner's Barracks is the collective housing area for several miners who work in the Left Hand Mine. 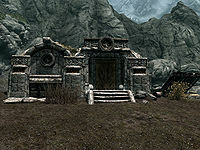 Before the quest Kolskeggr Mine is completed, two refugees will also live in the barracks, namely Pavo Attius and Gat gro-Shargakh. 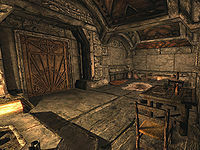 The barracks are obviously only used for sleeping and are pretty much empty, save for a table with three bottles of ale and a basket with a goat cheese wheel and some sliced goat cheese. There are two bedrolls on the floor and, along the western wall, a bed with a belongings chest with minor loot and a bucket with three samples of iron ore. All items are free to take and the beds are free to sleep in. This page was last modified on 12 November 2018, at 12:20.